Wow! Here we are almost at the end of another school year! I am amazed by how quickly it has flown by! Your children continue to amaze and delight me everyday! They are truly kind, compassionate young people that have worked hard and learned a lot this year! We had a fabulous time in Chicago yesterday! The weather was perfect and it sounds like everyone had fun. It seems as if the students are as tired as I am today! It is pretty quiet in here, I fear we may all succumb to a nap after lunch! I have a few reminders about upcoming events for next week. Tuesday is the 4th grade Bocce Ball and Rocket Launch Day. Please make sure that your child has sunscreen applied at home. We are not allowed to apply it at school if they forget. They will also need a sack lunch for Tuesday (no pop please) as well as snacks and drinks (water and gatorade are great choices)! Mr. Robinson has reminded the students that they can bring a blanket or beach towel to lay in the grass as well as a book or board game to play when they are in between rounds. Wednesday is 4th grade Celebration. This will take place in the Middle School Auditorium. Please be there no later than 6:30. 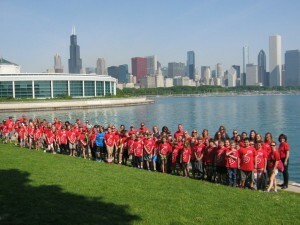 Here is a picture of all of us with the Chicago Skyline! Thursday and Friday, June 4 and 5 – half days and the last days of school! The end of the school year is rapidly approaching. We have a lot of important events happening in the next two weeks! I can’t believe we only have a handful of days left! 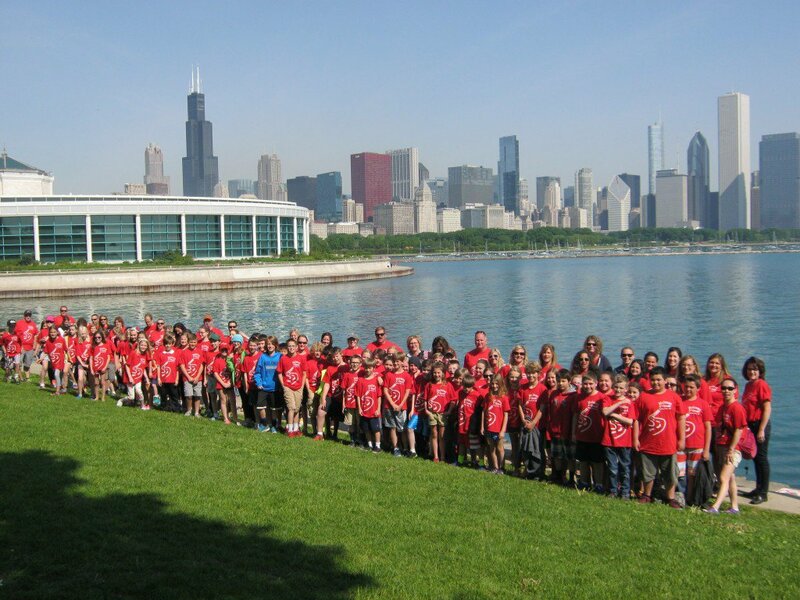 Next week Thursday is our Fourth Grade Chicago Trip! The students are super excited to go! On Tuesday, I will be sending home the Chicago t-shirts and a final reminder note about what to remember for the trip on Thursday! Please make sure that your child (chaperons too) wears their Chicago shirt on Thursday! Our Bocce Ball Tournament Day is On Tuesday, June 2nd. Mr. Robinson has sent home a note about Bocce Ball Day and is also looking for parent volunteers, please contact him if you can help! Mr. Overway is also having the 4th graders launch their rockets that day, he has also sent home a note and is looking for parent volunteers. Students will need to bring a sack lunch (no soda pop, please!) on Tuesday, June 2nd. They may also bring extra snacks and water or a sports drink to have throughout the day. You will need to make sure that you apply sunscreen and insect repellent at home on this day. We can not have them apply it at school. Sunscreen is super important, as we always have some kids that forget and get sunburned. 4th Grade Celebration is on Wednesday, June 3rd at 6:30 pm. Look for a reminder note to come home on Friday, June 29. Please email and let me know if you have any questions about any of our upcoming events! Tuesday, June 2 – iPads and chargers must be returned! All baggie book and classroom books due!! It is hard to believe that we only have three short weeks of school left! Where has this year gone? It seems as if we have been on fast forward since Spring Break! We have been super busy making sure that we get everything completed! Math ~ We are nearing the end of our very last Math unit for the year! Our Geometry practice test will be on Monday of next week, the review on Tuesday and the Final test on Wednesday! We have worked on symmetry, identifying quadrilaterals, decomposing quadrilaterals into triangles and then naming the triangles we made by their angles and sides. We also learned how to compose quadrilaterals by putting congruent triangles We still have an end of the year assessments to take for reading and math so we will be reviewing key concepts that we have learned throughout the year. Reading ~ We have been reading informational text (non-fiction) and have been learning how to pull out the most important information to remember and details that support the important information. Students are doing this in their Informational Book Clubs as well. Writing ~ We are putting the finishing touches on our Animal Research Project. Students have researched an animal from The Lincoln Park Zoo and have created informative posters to display. All 4th grade students will be taking part in “A Gallery Walk” to view and comment on each other’s posters. Social Studies ~ We have completed our Economics Unit with Market Day as our culminating event! The students did a great job with creating a product to sell, pricing it and marketing it and then we had to do some accounting to figure out profits! We had a few companies that operated at a loss and we talked about the reasons this could have happened. Students also donated a portion of their profits to a charity that the 4th grade chose. Make-a-Wish was the chosen charity. Our class donated $105.61 of their Market Day profits. The grand total for the 4th grade donation was $200! I am so proud of my students and their generous hearts! We have started our Government Unit this week as well. We have talked about the U.S. Constitution and have focused on the Preamble. Students are creating a Preamble project that helps them to understand the meaning of the words in the preamble. Look for these to come home next week! Please enjoy our Market Day photos in the slideshow below. Here are some important upcoming dates and events. Please check my blog each week for updates!